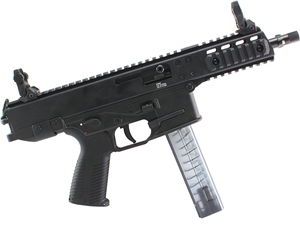 The GHM9 is a sporty 9 x 19 mm pistol with compatibility for the B&T folding stock(NFA Rules Apply). The GHM9 is a perfect and inexpensive semi-automatic pistol for dynamic shooting as well as just for plinking. New Gen 2 model capable of handling a wider variety of Hollow Point ammunition. Gen 2 models utilize Glock compatible bolt carriers for use with upcoming B&T Glock lowers. Gen 2 models also feature interchangable handguards and barrels.